2.1 The impact of effective research investment is clearly demonstrated by the increased survival rates for people with certain cancers, such as breast and prostate cancer. Funding for cancer research comes from various sources, including the National Health and Medical Research Council (NHMRC), which, as discussed further below, recently restructured its grants program. 2.2 This chapter commences by defining cancer research and then examines the various sources of funding for such research, focussing specifically on government funding through the NHMRC, Cancer Australia and the newly established Medical Research Future Fund (MRFF), as well as philanthropic and pharmaceutical funding. 2.3 The chapter then provides some context to the challenges facing funding for research into low survival rate (LSR) cancers by providing an overview of the Therapeutic Goods Administration (TGA), the Pharmaceutical Benefits Advisory Committee (PBAC) and the Pharmaceutical Benefits Scheme (PBS). The chapter concludes by examining the available funding for LSR cancers. 2.4 In 2016, Cancer Australia published a report into the funding for cancer research projects in Australia from 2016–2018, using data from grants awarded to these projects to the end of July 2015. 2.5 This report identified that the Australian government is currently funding 74 per cent, or $187 million, of the $252 million that has been provided to 589 individual research projects for the period 2016–2018. Ninety five per cent of these research projects are funded by a single source. 2.6 The following figure illustrates how cancer research funding for this period has been allocated by reference to the Common Scientific Outline (CSO), a system which 'uses easily applied terminology to describe and classify research by where it best fits into the cancer research continuum'. 2.8 This figure illustrates that translational research in the clinical, general and patient‑oriented categories will receive less than 10 per cent funding each for the 2016–2018 period. Funding bodies such as the NHMRC traditionally do not support translational research, therefore these breakthroughs are often not capitalised on and further developed. Often funding for basic research is preferred over clinical trials, as it can have more immediate results. As an example, in February 2017 an incredible breakthrough was published in the international journal Nature for the genome sequencing of pancreatic nets, led by Melbourne University researchers. This research now needs to be supported and built upon, in order for it to have an impact on patient outcomes. 2.10 Indeed, The Unicorn Foundation similarly identified that 'the current NHMRC model does not actively support translational research in low survival cancers' and advocated for 'a new model of funding' for the NHMRC and support for clinical trials for LSR cancers. The NHMRC is interested in funding research that covers the whole spectrum from discovery research, which might help us to understand the origins of disease and also the origins of health, but we seek to fund across the full spectrum from discovery through to translation into better health care. We fund many clinical trials that assist in that translation of new ideas, new discoveries, into better health care. We also fund research to improve health services across the board. So there is a very broad range of research that NHMRC funds, and some of it is very directly translational and some of it is earlier stage. There are the basic NHMRC studies, which are very much discovery-type stuff, and then there is the other end of the spectrum, which is the clinical trials-type activity. I think the clinical trials activity is usually fairly explicit and straightforward in what the aims are. I think there is an understanding behind that. The issue is that running a clinical trial, as I am sure you have heard, is an incredibly expensive endeavour and takes a large slice of the budget. So you only have to, I suppose, fund a few of those and you have basically taken a huge chunk of your budget away from the discovery sector. ...translational outcomes, to some extent, represent marketing speak. Politicians must be aware of the power they have. If the decision is made to favour an area then everybody, in the current funding climate, will jump at this. Administrators will and researchers have to follow but that is wrong. Researchers are the ones that are supposed to come up with the innovations. They are not being listened to often nowadays, because of the way—based on a global trend—science has changed. In the old days it was just idealists working somewhere without pay—some still work without pay today. Generally institutions cannot afford it and that is the big problem—the research dollars. I cost the university money. Teaching is much more attractive, but, of course, it would be living on intellectual credit if we would not support the research. That is the future. I think it is really important how this is marketed—directed by the politicians. Translational outcomes flies well with politicians, but it is important to really look at the substance. What is really being produced? Where is innovation coming from? How can we enable that? It will not come just through some policy decisions. Scientists are not motivated to engage in it, because it is like the 'fashion scientist', who makes a career by being in policy making. We are about innovation. We are supposed to find new things that are reproducible. That is our job. It is not to compete with politicians implementing policies. That is my personal view, so do not blame it on the university. That is my view, and I am happy to defend it. 2.15 There are many different government and non-government sources of funding for medical research. Although government funding can include funding directly from the Department of Health (DoH), this chapter exclusively examines funding from the NHMRC, Cancer Australia and the MRFF, which were the government sources most frequently referred to in submissions and evidence to the committee. At points throughout this report, there may be references to other sources of government funding. 2.16 In addition to government funding for medical research, a significant amount of funding is also provided by non‑government sources, particularly philanthropic and pharmaceutical sources. For this reason, this section also briefly examines these sources of funding. any functions incidental to any of the foregoing. 2.18 The minister may also delegate additional functions to the CEO. 2.19 The Council of the NHMRC provides advice to the CEO in relation to the performance of these functions, and also performs any other functions conferred by the minister, the NHMRC Act, its regulations, or any other law. One of the things that happened with NHMRC funding in the period from 2000 to about 2010 was that the funding was doubled, and then it was doubled again. That was a great outcome; it was really good news for the sector. What it has done is attract a whole lot more people into the field. We are seeing more people undertaking PhDs in this area. I think the latest budget figures were predicting that Australia-wide we were going to move from 9½ thousand PhD completions last year to 12½ thousand by 2019-20. So we are seeing an increasing number of people coming into this area. 2.21 However, Mr Mullins opined that the availability of NHMRC funding to support these researchers and their work is lacking, which is consequently reflected 'in things like the drop in the success rates with NHMRC funding'. The difficulty of securing NHMRC funding was also identified by Dr Bryan Day, who informed the committee that 'the competition in the current NHMRC funding pool is incredibly high, because the pot of money is small'. Consistent with the NHMRC Act, NHMRC focuses on the relevance of research proposals for health, rather than defining ‘health and medical research’ as a set of research disciplines. NHMRC will fund research in any or all areas relevant to health. It will also accept grant applications in any research discipline and applicants are provided with an opportunity within their application to explain how their research will lead to improved outcomes in health. Most NHMRC funding is awarded in response to investigator-initiated applications in which the research is conceived and developed by the researchers. A smaller proportion of funding is directed to specific areas of unmet need, e.g., through Targeted Calls for Research, special Centres of Research Excellence, Partnership Centres and some Partnership Projects. The primary criterion for all funding decisions is excellence. NHMRC relies on review by independent experts to identify the best applications, based on the significance of the research, the quality and feasibility of the research proposal, and the track record of the investigators. Rigorous processes of expert review ensure transparency, probity and fairness. When applications for funding are received, the office of NHMRC manages the expert assessment of applications by independent experts. The outcomes of expert review are used to determine which applications will be recommended for funding. NHMRC’s [Research Committee] recommends those applications to be funded through NHMRC Council to the CEO who submits them for approval to the Minister with portfolio responsibility for NHMRC. NHMRC’s range of funding schemes also provides the flexibility necessary for targeting research and capacity building in key areas of need in the health system. Each year NHMRC sets aside a component of the [Medical Research Endowment Account] to address identified priorities. Priorities are often implemented through additional funding provided for existing NHMRC schemes, such as the Centres of Research Excellence scheme. Each year, a small proportion of the total annual expenditure budget is set aside to fund priority research areas through its Targeted Calls for Research (TCR) funding program. A TCR is a specific funding mechanism that invites grant applications to address a specific health issue. NHMRC may initiate a TCR to address additional major issues that arise or in cases where substantial gaps in evidence are identified. The aim of a TCR is to stimulate or greatly advance research in a particular area of health and medical science that will benefit the health of Australians. Through the TCR program, NHMRC has an opportunity to identify and subsequently fund emerging health problems in Australia. ...is based on the review of each grant against a range of investigator-provided data classifications including Burden of Disease allocations, fields of research, keywords, grant titles and media summaries. Many grants address more than one cancer type and in these cases the full value of each is attributed to each relevant cancer type. ...based on the review of each individual grant against a range of investigator provided data classifications including Burden of Disease allocations, fields of research, keywords, grant titles and media summaries. Many grants address more than one cancer type and in these cases the full value of each is attributed to each relevant cancer type. 2.26 The NHMRC also provided the following additional table comparing its research expenditure with incidence, mortality and survival rates, for 'all persons', except in the case of the following gender-specific cancers: cervical, ovarian, uterine, prostate and testicular cancers. The data for cancer incidence, mortality and survival rates were sourced from the Australian Institute for Health and Welfare (AIHW). 2.27 A number of submitters and witnesses criticised the former NHMRC funding model—in place up until the minister's announcement on 25 May 2017—and its 'one size fits all' approach asserting that it disadvantages, or is biased against, researchers into LSR cancers. We believe that characteristics of low survival rate cancers can make it more difficult for associated research grant proposals to be considered “well designed (or to have) a near flawless design”. The fact that a particular cancer is characterised by poor survival rates can reflect a more limited research base, leading to less scientific knowledge. This can mean a greater need for more open-ended research grant applications seeking to (for example) identify treatment targets, or biomarkers of response. However, these more open-ended proposals can be viewed by grant review committees and reviewers as “fishing expeditions” that may be less likely to be considered to have “objectives that are well-defined, highly coherent and strongly developed (and be either) well designed (or have) a near flawless design”. Similarly, low survival rate cancers may have fewer experimental models (cell lines, mouse and other animal models) available for study. It can also be challenging to access statistically informative and representative sample cohorts, or patient cohorts for clinical trials. Reduced resources for research could therefore also lead to reduced “scientific quality” and “significance and innovation” scores for NHMRC project grant applications, as well as negatively impacting the team’s “track record”. One of the most problematic issues is how the determination of “an issue of great importance to human health” is made, as this judgement can clearly be made according to various criteria. The association between lower cancer incidence and reduced patient survival can mean that research into some cancers with poor outcomes could be viewed as less “important”. 2.29 The LCSA similarly outlined how this funding program disadvantages 'researchers investigating low survival cancers, who generally have less pilot data or proof of concepts than those researching more common cancers with better outcomes'. It submitted that '[t]he NHMRC is not a reliable method for many researchers wishing to secure research funding for low survival cancers to get worthwhile projects off the ground'. In order to get something to the standard that NHMRC requires to really be competitive, that study pretty much needs to be 80 per cent complete. You need to convince these reviewers that this grant is foolproof, that it will work, and that is not really what research should be all about. It is all about figuring out that, actually, maybe something will not work. That in itself may then be an interesting result that you take further and develop new ideas around. I guess philanthropic money is really where those sorts of studies are currently done, and there is just not a lot of that money around. I am talking about pancreatic cancer researchers in general. I am fortunate enough to have the support of the Garvan Research Foundation, so I have been able to get my studies to that level to get NHMRC and Cancer Australia funding on occasion. potential commercialisation of intellectual property. As a consequence of the continuing under funding of indirect research costs, researchers need to find other sources of funding for the balance of the indirect costs. In the case of universities and medical research institutes, these sources include their own funds and philanthropic funding; some of the latter are directed towards supporting research into specific diseases. The availability of funding from philanthropic sources to meet the indirect costs of research can influence the types of research that an organisation will undertake and the applications that it will make to the NHMRC for funding. To the extent that there is more funding available from non‑government sources to support research into a particular disease, this can lead to more applications to the NHMRC for funding in that area. This can favour research into areas that have strong philanthropic support. Conversely, areas of research that receive relatively less funding from non‑government sources can be less successful in the open, competitive grant schemes administered by the NHMRC and other government funding agencies. Philanthropic sources of funding are divided between patient support services and grants for research and these funds can make a significant impact on preliminary research activity. Higher levels of philanthropic funding for the various charitable cancer foundations has typically been related to (i) higher survival rate cancers, where survivors are active in fundraising to “give back” to the field, and (ii) high incidence cancers, where a large pool of affected individuals and families can be leveraged for philanthropic donations. Low incidence and low survival cancers do not have these resources and moreover, there may be social stigma related to the cancers, e.g. lung and brain cancers. ...the success rates of applications reflect the far greater pool of resources available to researchers working in certain areas, e.g. breast cancer, that supports them being successful researchers who will in turn have greater success at NHRMC, i.e. it is the funding of preliminary work, which requires scientists, expendables and infrastructure, that results in a high-scoring funding application. It is also this funding that can enhance track record and demonstrate that a research group can complete the project. 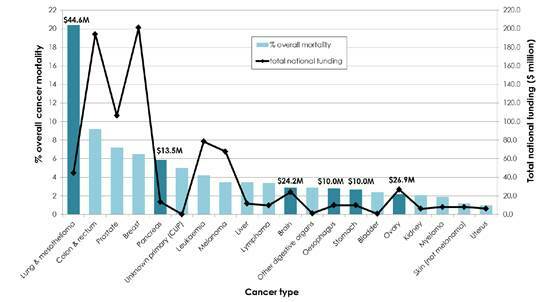 This tends to be in the cancer types that have already shown research success and improved outcomes (which are more noteworthy than failures in poor outcome diseases), further compounding the disparity between highly-funded and low-funded research. ...would allow more philanthropic funding to be directed to support novel early stage research and early career researchers, in turn helping to improve their chances of securing Australian Government competitive grant funding. 2.36 On 28 January 2016, the NHMRC CEO, Professor Kelso, announced 'an over‑arching review of the structure of NHMRC's grant program', which was considered necessary for a number of reasons. 2.37 One reason was the decrease in funding for most of the NHMRC's funding schemes from 2012 to 2015, which created 'a hypercompetitive environment, and [maybe] lead to research proposals targeting low survival rate cancers being increasingly disadvantaged'. 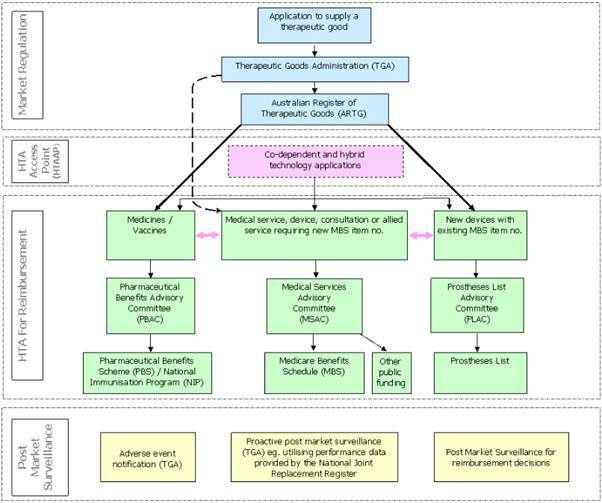 This is illustrated by the following example of the Project Grants scheme at Figure 3. Researchers are spending a substantial period each year preparing grant applications that will not be funded, despite many being of sufficient quality to be funded. The load on peer reviewers (most of whom are themselves researchers) has become excessive for the number of grants funded. Early and mid-career researchers, especially women, may feel discouraged from pursuing a research career. Applicants are more likely to propose, and peer reviewers are more likely to favour, “safe” research to the detriment of innovation. The low likelihood of funding is driving further increases in application numbers as researchers seek to improve their chances of obtaining a grant, exacerbating the situation. 2.39 The NHMRC’s Research Committee, after considering a range of options, reached the conclusion 'that commonly suggested changes to existing funding schemes would not achieve a sufficient reduction in application numbers' that would overcome such issues. 2.40 Indeed, in 2015, many submitters to the NHMRC's public consultation on Current and Emerging Issues for NHMRC Fellowship Schemes called for an overarching review of the NHMRC's grant program. ...whether the suite of funding schemes can be streamlined and adapted to current circumstances, while continuing to support the best Australian research and researchers for the benefit of human health. 2.42 On 14 July 2016, the NHMRC released a public consultation paper on the review, and public forums were also held in several capital cities. 2.43 During the process of the NHMRC's review into its funding structure, an Expert Advisory Group 'provided advice and assistance to NHMRC in examining the current grant program and possible alternative models'. The CEO subsequently drew on its advice in formulating the new funding structure, as well as that of the NHMRC Research Committee, the NHMRC Council, Health Translation Advisory Committee, Health Innovation Advisory Committee and the Principal Committee Indigenous Caucus. minimise the burden on researchers of application and peer review so that researchers can spend more time producing high quality research. The restructured program will comprise Investigator Grants, Synergy Grants, Ideas Grants and Strategic and Leveraging Grants. Limits will also be placed on the number of grants an individual researcher can apply for or hold. 1 1 2 Not capped relative to Investigator, Synergy and Ideas Grants. Dependent on individual scheme. 1 1 Up to 2** Not capped relative to Investigator, Synergy and Ideas Grants. Dependent on individual scheme. ** A maximum of two grants can be held concurrently, by any individual, with the following exceptions and conditions: (1) individuals who hold two Ideas Grants can hold concurrently a Synergy Grant, (2) individuals who hold up to two Ideas Grants can apply for, and hold an Investigator Grant, but their RSP will be discounted until the Ideas Grant/s have ended and (3) individuals may apply for an Investigator Grant concurrently with an Ideas Grant, and if both applications are successful only the Investigator Grant will be awarded. The purpose of this scheme is to focus on research which is highly innovative, creative and does not require that somebody has a long track record of research, which is an impediment for many people getting started, attempting to change fields or addressing an important new question. Of course, it's still going to be highly competitive, it's going to be highly rigorous but it will have a different flavour from the current Project Grants scheme, which has become increasingly competitive, such that people's track records have become a very important driver in that scheme. So I'm very optimistic that the Ideas Grants scheme is going to fill an important gap in our current range of schemes. 2.47 Dr David Whiteman of the QIMR Berghofer Medical Research Institute welcomed that the Ideas Grants were 'less focussed on track record and more focussed on innovation', and acknowledged that while it is not a large pool of money, 'it is a pool of money to address the issue of innovation and ensure that innovative cutting‑edge ideas from younger early-career investigators get picked up'. ...is a huge step forward for everybody in terms of the amount of time writing grants and the amount of time reviewing grants and also the amount of time it takes to do high-quality research. You cannot do this in a three-year funding cycle. It is just too short, especially for an organ system like the brain, because the work is slow and time-consuming and it takes time to do quality research. One thing though is that the NHMRC does have a fourth category, which is for targeted research, and I would implore you that brain research, in particular brain cancer, is one of those areas that we should be targeting in this country. It is really hard to get long research programs, because most of the project grants are for three years. Sometimes setting up something ambitious or that is more risky takes more time. For instance, even though we did not have funding for it, we invested three years to develop a mouse model. It took us three years to get the exact model to mimic certain cancer development. It is really hard to get funding for those kinds of things and sometimes you have to think far ahead and invest a lot in developing techniques and novel ideas that do not really directly fit in a project realm. There is always an assumption of a small group of people working on something that is finished within a certain set time. Whereas we, especially with rare cancers, because we do not know that much yet, need to really develop these things with multiple people from multiple different disciplines to work on it. It is really hard to get sufficient scientific funding for that. I think this would also help. But at the moment we have to think in packages of three years, which makes it harder. The problem is that people give you the money to set something up and give you the infrastructure and the equipment, but there is no longevity, so there is no funding to continue what we are doing. I have seen a lot of biobanks go out of business when they have lost their funding from the NHMRC. The problem is that we have a duty of care to these patients. We have collected their samples to help other patients. If we lose our funding, then we have to basically shut the doors, which is what happened at [the University of Queensland] with their brain bank. ...to develop a new drug, from the initial stages through to the end, takes anywhere between 10 and 15 years and can cost up around $3 billion. So these are very intensive processes that need support over a long period. The focus is shifting away a little bit from the old fashioned program grants, where you got a number of multidisciplinary teams, a number of different people who had come from different institutions, who worked together to support a particular research initiative. They typically tended to be a bit bigger. We have yet to see how the restructure plays out, but the NHMRC funding structure might not now be the ideal support for the type of multidisciplinary approach that we need to really tackle [survival rates] properly. 2.53 Cancer Australia, a statutory body established in 2006 pursuant to the Cancer Australia Act 2006, is 'the lead national cancer control agency' and 'aims to reduce the impact of cancer, address disparities and improve outcomes for people affected by cancer by leading and coordinating national, evidence-based interventions across the continuum of care'. any functions that the Minister, by writing, directs Cancer Australia to perform. 2.55 In its submission, Cancer Australia noted that it performs its function to oversee a dedicated budget for research into cancer through administration of the Priority-driven Collaborative Cancer Research Scheme (PdCCRS). foster consumer participation in cancer research, from design to implementation. We look at the national pattern of funding to cancer research, which includes the funding that is provided from both national and international sources, and, using that profile, we examine the funding that goes to different tumour types as well as the funding across the broad areas of the research spectrum—the main areas of the funding to where that project goes. We then use that evidence to identify opportunities for us to make strategic investments where there are gaps or opportunities to further research. That, for example, can be in tumours which may be of high burden and poor survival, where there are opportunities to strategically invest to address that. ...from the top-ranked merit based application downwards. We maximise the amount of funding, or the number of grants that we're able to fund, through collaborative funding with our funding partners in the scheme. We start from the top down. Once the funding has ended, that's where we have to stop funding. I think the activities that Cancer Australia has done in just looking back and saying: 'What have we funded previously? Does that reflect where we want to invest our funding?' are very helpful, because they then put the spotlight on neglected areas of research, including low-survival cancers. I think there is a mood for recognising where there are deficits in funding, and then looking for mechanisms to correct that. ...the ALLG, and now 13 other cancer trial groups around Australia, have been able to have funding come straight from Cancer Australia. That is about half a million dollars a year. The infrastructure that it supports is very specific because Cancer Australia is very specific about how it can be spent. So it goes towards the activities that develop clinical trials. For us, in the ALLG, we utilise that funding on EFT and on roles and positions that help prepare the clinical trial protocol. The protocol is the instruction document that is going to go to the hospital to tell them what to do in a very methodical and meticulous way. You cannot understate the importance of preparation. Preparation is key. 2.61 However, the committee also heard that Cancer Australia could have a lead role with respect to 'developing, implementing and maintaining' a sustained focus on LSR cancers. Further discussion about a national strategy for LSR cancers appears at chapter 5. ...a sustainable source of funding for vital medical research over the medium to longer term. Through the MRFF, the Government will deliver a major additional injection of funds into the health and medical research sector. 2.63 The $20 billion fund 'offers the opportunity to strategically fund research and address national priorities in a cohesive and coordinated way'. The MRFF 'complements existing medical research and innovation funding', such as the NHMRC, the Commonwealth Science Council and the National Innovation and Science Agenda, 'to improve health outcomes by distributing new funding in more diverse ways to support stronger partnerships between researchers, healthcare professionals, governments and the community'. The Medical Research Future Fund consists of the Medical Research Future Fund Special Account and the investments of the Medical Research Future Fund. Initially, the Fund’s investments are a portion of the investments of the Health and Hospitals Fund which was established under theNation—building Funds Act 2008. Additional amounts may also be credited to the Medical Research Future Fund Special Account. making grants of financial assistance directly to corporate Commonwealth entities. The National Health and Medical Research Council largely gives funding out in reply to specific proposals from individual researchers. It does have some priority areas which it uses, but the vast majority of funding is in response to a particular proposal on a particular bit of research determined by the investigator themselves. The Australian Medical Research Advisory Board advisory to the Medical Research Future Fund rather takes the view of top-down driven research where we have recommended to the minister priorities where we believe that research money should be best spent. Therefore, while there might be a call for proposals in due course, at the moment the money is being dispersed on the basis of the priorities and strategies that we set when we completed our consultation with the medical research community, the general public and other interested parties in the course of 2016. Certainly, the funding will have to be administered by one individual organisation which is responsible for its acquittal back to government. But the concept of collaboration in research is pretty much international, of course. Certainly, there is nothing intended about the way that we made the strategy of priorities to suggest that we did not wish to see collaboration. In fact, we positively expected that there would be collaboration and pointed out that the value of collaboration, for example, between different research institutes in this country and overseas, and research institutes and industry, should be positively encouraged. 2.67 Following consultation with the sector and the broader community, and pursuant to the MRFF Act, the AMRAB developed six strategic platforms to underpin the Australian Medical Research and Innovation Strategy 2016–2021 (the Strategy) that 'capture and group together themes and provide a framework for the [Australian Medical Research and Innovation Priorities 2016–2018] to improve research capacity and capabilities in the research sector'. A list of priorities falls under each of these strategic platforms. 2.68 The Strategy also sets out how the MRFF aligns with and compliments the NHMRC, the National Science and Innovation Agenda, and other interests, such as state and territory governments and the private and not-for-profit sectors; as well as the challenges facing the health and medical research sector. commercialisation: supporting 'the creation and brokering of linkages between researchers and industry that are transdisciplinary in nature', noting the need for '[a] two-way exchange of knowledge and expertise in research, and its translation into clinical practice' and better encouragement 'adoption of the requirements for successful commercialisation in both the academic and business environment'. ...we may actually have to get focus groups together and specifically engage, through the recruitment of individuals who would not otherwise necessarily come forward, to get a more general representation of what the public is interested in. One of the practical realities, of course, is that people become most interested in the health system when they actually need to use it, and yet the vast majority of people out there who might, in the future, benefit from it, do not actually use it at the moment. It shouldn't just be in the discovery science; it needs to be across the whole of translation. But I think it's absolutely critical that that is done in a way that maintains the standards of excellence in research, maintains the standards of scientific quality, makes sure that we apply the same well-established principles that organisations like NHMRC have had for peer review and for quality, and that that continues. 2.72 However, Dr Richard De Abreu Lourenco warned that if the MRFF were to be used for discovery research, it could be viewed 'as an implication of support for commercialisation' from the government. $20 million for preventive health and research translation projects. $33 million for clinical trials that will build on Australia’s world class research strengths and ensure Australia is a preferred destination for research. $12.9 million for breakthrough research investments that drive cutting edge science and accelerate research into better and new treatments and cures. 2.74 Professor Terrance Johns of the Brain Cancer Discovery Collaborative, who stated that his institution 'is not a large institution with political clout', noted that '[t]here was no call for grants for MRFF funding' for its first disbursements, and observed that the funds are 'pretty much locked up by the G8 universities'. Professor Johns opined that, at present, the MRFF 'is about political clout'. 2.75 However, Mr Peter Orchard, whose organisation CanTeen Australia was a recipient of some MRFF funding, suggested that '[t]o some extent, the MRFF is in its absolute infancy, and so being able to comment on it feels difficult at this stage, other than to say I am very grateful for it'. ...the MRFF funding, with its emphasis on translation, offers new opportunity for advances that will benefit patients. The MRFF, importantly, also has a top-down approach to funding. It is driven by a five-year strategy and priorities, and the latter must explicitly take into account the burden of disease, how to deliver practical benefits to the Australian community and value for money. This must be combined with a focus on funding excellent research, obviously, if it is to be successful, but it provides greater scope for strategically directing funding to particular areas. 2.77 As indicated at paragraphs 2.32–2.33 above, philanthropic funding can be vital to advances for research into LSR cancers, especially when researchers find it difficult to obtain government funding. 2.78 Indeed, it was noted by the ANZCHOG National Patient and Carer Advisory Group that 'oncology units are often largely dependent upon philanthropic and charitable donations' to meet costs associated with enrolment in and compliance with international trials, emphasising that '[c]urrently paediatric centres rely heavily on philanthropy, charities and individual hospital budgets to fund most cancer clinical trials'. The [CBCF] has done terrifically well through, really, one individual driving that over many years, but they now have a very established philanthropic organisation that runs professionally and relatively independently. We have made sure that there is rigour to their grant application process and the grants that have been given out. It is not in competition with NHMRC. It has grown because of the need for it. It would be great if we did not have to have philanthropic funding, but actually we are lucky in brain that at least there is some. We have only had one round of grants, which total up to $2 million, I think. The trouble with the philanthropic side of things is often you need survivors, who generate a lot of push for these sorts of things. They go to companies. The catch 22 is that, if you have a poor-survival cancer, you do not have many survivors. If it is affecting a lower socioeconomic group, you do not have the movers and shakers. Once you have a critical mass of funding you can then do more with it—you can advertise more and you can grow your foundations more. There are numerous lesser-known small cancer foundations which really do exist on the smell of an oily rag. 2.83 The committee therefore heard calls for various improvements in respect of philanthropic funding. For example, in addition to the recommendation by Research Australia at paragraph 2.35 above that the government fund indirect costs of research in order to 'allow more philanthropic funding to be directed to support novel early stage research and early career researchers', Professor Guy Eslick called for greater philanthropy from 'wealthy Australian businesses and individuals'. 2.84 In his submission, Professor Eslick drew a contrast between the philanthropic funding Harvard University received for research during his post-doctoral training at Harvard ($100 million), compared to that received by the University of Sydney in that same week ($10 million). Professor Eslick suggested that the government could encourage philanthropists to donate to universities and research institutions by offering greater incentives. Ovarian Cancer Australia recommended the development of 'a national strategy for coordinating the planning and funding of cancer research across the government, medical, health, research and philanthropic communities'. ...we have found that there is both an appetite amongst philanthropy to invest in the haematology of less common cancers and in the high-risk, high-return research. I think what is critical here though is that one of the things that makes it more likely that philanthropy would fund these is if they can have assurances over the quality or the rigour of the scientific processes that assess those proposals. I think there is opportunity to bring together the best scientific minds to assess high-quality proposals that can be funded by philanthropic organisations like ours, or indeed others. I think government can also play a role in providing seeding or cooperative funding to enhance the chances of those programs being successful and the chances of those programs being successfully funded. 2.88 A number of witnesses, whose clinical trial research was funded by pharmaceutical companies, outlined for the committee the importance of funding from pharmaceutical companies for cancer research. However, as the below evidence demonstrates, many witnesses were also critical of the reluctance of pharmaceutical companies to become involved in drug development for people with LSR cancers. The pharmaceutical industry is a critical component of the innovation ecosystem. Not only does industry contribute to basic research and takes the lead in taking medicines through regulatory and reimbursement processes, it is also the leading funder of clinical trials. 2.90 Roche identified that improving survival outcomes for people with LSR cancers is dependent on a number of factors including overcoming barriers to participation in clinical trials (by clinicians as well as patients), and affordable access to treatments through the PBS. Roche identified that '[b]reakthroughs in personalised medicine and immunotherapy are offering hope to patients with both common and rare cancers – yet these products face many challenges in navigating the reimbursement system'. 2.91 Indeed, a recent Deloitte Access Economics (Deloitte) report noted that currently, 'only a small proportion of the potential indications for which immunotherapies are able to be used in cancer treatment receive subsidised funding from the Government', and as these therapies are expensive to develop and produce, treatments 'are prohibitively expensive for many patients who seek to self-fund'. A further discussion of this report, and its recommendations, appears at chapter 5. The broader policy environment is also challenging the investment decisions made by pharmaceutical companies. Increasing levels of uncertainty caused by a single payer system, as well as inconsistent approaches to intellectual property, aggressive pricing policies and an unpredictable policy environment, are among the issues which Medicines Australia finds to be of some concern. 2.93 The committee also received evidence that there is a limited incentive for pharmaceutical companies to fund clinical trials for LSR cancers, with one witness describing the lack of funding for brain tumour research 'very disappointing'. Other barriers to clinical trials distinct from pharmaceutical funding that are faced by people with LSR cancers is examined in chapter 3. ...pharmaceutical companies have been turning away from drug development for brain, partly because we, firstly, did not know enough about the pathways involved to make the clinical trials effective. Also, for rare diseases, of course, the market is not there for the company to want to invest in a drug that is going to be used by a small number of patients. 2.95 The ANZCHOG National Patient and Carer Advisory Group also recognised the importance of return on investment for pharmaceutical companies, submitting that '[t]here is little economic incentive for pharmaceutical companies to fund paediatric cancer trials' as childhood cancers are 'made up of rare and ultra-rare diseases'. The costs of running such trials are disproportionate to the potential profit when there are few potential “customers”. When those who may benefit have inherently poor prognoses, courses of treatment are likely to be short, and this further minimises the return on research investment. Hence there is no financial incentive for private enterprise to conduct such trials, especially in Australia due to its decentralisation and small population base. Historically, this was very much an academic pursuit and there were not new drugs, as I outlined, so we were able to do this amongst ourselves. As these new drugs are developed, we increasingly have to partner with pharma companies. Australia is not a big market. It is expensive for them to open these trials in Australia. There may be only one, two or three Australian patients that are eligible for a particular trial. So we need to work out a structure that means we can still participate in these trials. The first step to that is to make sure that we have a very robust clinical trials infrastructure so that we are up and ready to start these trials so the pharmaceutical companies know that the infrastructure and the organisations are there to make sure that the process will run smoothly. The financial costs of conducting clinical trials have doubled every nine years for the past 50 years. The estimated combined costs per patient in a cancer clinical trial rose from less than US$10,000 to around US$47,000 between 1980 and 2011. The average phase 2 study of 40 patients costs upwards of US$2-10M, while the average phase 3 study costs upwards of US$40M. Average development costs are estimated at around US$3.6 billion dollars per drug. ...access to study drugs for each module and for engagement with the pharmaceutical partner in data interpretation, as well as decision-making regarding expansion of a drug–disease cohort in which a significant signal of activity has been identified. ...we invest in drugs by where they are arise. If you invest in breast cancer, you authorise and reimburse drugs on the basis that it works in breast cancer, and that drives the way in which pharma invest. The problem is that many of these drugs work across a whole range of cancers, because a whole range of cancers have this particular common molecular abnormality. A molecular taxonomy is required. That requires molecular screening. Pharma cannot invest in screening 10,000 people to find 20 to treat, but we can. If we can match our research investment with the opportunities from pharma, so we can create a healthy model of collaboration with the benefit of pharma in mind but also getting patients onto trials, that is a virtuous cycle. 2.101 Further discussion about clinical trials appears at chapter 3, and further discussion about the treatment of cancer through personalised medicine and immunotherapies is found in chapter 5. 2.102 In order to understand the challenges that face people with LSR cancers, and why those 30 per cent of cancer deaths in Australia that are 'a consequence of the lack of investment in research' receive six per cent of all drug funding, it is necessary to briefly examine the key mechanisms that determine affordable access to medicines. As the national therapeutic goods regulatory reform agenda has resulted in welcome amendments to the definition of such things as ‘orphan’ drugs, and will speed up regulatory approvals in certain cases of high unmet need, it is now also time to review the reimbursement processes for those medicines. 2.104 However, Professor Andrew Wilson, Chair of the PBAC, informed the committee that an 'orphan drug' is not a PBAC designation, but one made by the TGA, and further noted that 'basically it's a situation where you've got a disease where there aren't very many other treatments available for it—a rare disease without any other treatments for it—although sometimes it's also used where there are no other drugs'. 2.105 Figure 4 sets out how the Health Technology Assessment (HTA) process—performed by the TGA, Medical Services Advisory Committee (MSAC), PBAC and the Prostheses Advisory Committee, which provide advice to the Australian government—works in practice. 2.106 As can be seen, the first step in the HTA process is for a medicine to receive regulatory approval from the TGA. This will be required for the use of a medicine by a patient unless: a medical practitioner has been granted authority to dispense a drug to specific patients with a medical condition; a patient has been approved for access to a drug, which is determined on a case by case basis; or there are specific circumstances to warrant access to the drug. ...cannot make a positive recommendation for a medicine that is substantially more costly than an alternative medicine unless we're satisfied the proposed medicine also provides a significant improvement in health for at least some population. ...identify ways to assist medicine and medical device producers and suppliers struggling with complex and costly regulatory pathways, while upholding the safety and efficacy of therapeutic goods available in Australia. improving transparency and predictability of processes and decisions to build trust and confidence in the Australian National Regulatory Authority's ability to ensure Australians have timely access to high quality, safe and efficacious products. ...provided a strong case for the reform of the regulation of therapeutic goods in Australia - one that strikes a balance between supporting consumer choice, the safe and effective use of therapeutic products, creates flexibility for industry and ensures that regulatory settings are appropriately aligned to risk. ...in a staged approach over the next three years in order to maintain continuity of business. The Department of Health will collaborate and consult across government and with consumers, health professionals and industry in order to progress these reforms. The TGA, where necessary, will cost recover from industry so as to ensure that it is adequately resourced to implement these reforms and undertake the ongoing work without interrupting business as usual. The Government understands that consumer, professional, and industry groups are looking for immediate action. Accordingly, the Department of Health will commence work on designing implementation of the recommendations, with a view to implementing early opportunities in 2016-2017. Implementation of this important programme of reform will deliver significant benefits for the Australian public and to the Australian medicine and medical device industries. consumer protection will be enhanced through the development of a more comprehensive system of post-market monitoring which will provide the TGA with better information about emerging safety issues. This will ensure that therapeutic goods in Australia continue to be safe for use, efficacious and of a good quality. This large program of work was divided into two tranches; the first set of legislative changes were passed 14 June 2017. These focused on new assessment pathways for medicines and medical devices. The second tranche of legislative review is underway. The progress of these amendments may influence the timing of some regulatory changes. the priority review pathway for prescription medicines, which 'will involve faster assessment of vital and life-saving prescription medicines for which a complete data dossier is available' within 150 working days, which is 'up to three months shorter than the standard prescription medicines registration process'. ...will provide earlier access to certain promising new medicines that do not yet have a full dossier of clinical data, but where there is the potential for a substantial benefit to Australian patients through the earlier availability of these medicines. establish a Steering Committee to examine the feasibility of establishing a national register of cancer medicines. Patients and sponsors will benefit from two expedited pathways being implemented by the TGA, which will help to achieve earlier regulatory approvals of new life-saving medicines such as new cancer medicines, or to extend uses of existing medicines to treat a new population of patients (for example, a treatment already approved for one type of cancer being used to treat another type of cancer). 2.118 The government recognised that, although the MMDR review 'did not include consideration of PBS listing and PBAC processes' the implementation processes in response to the review will impact on these processes. ... a pilot project involving a joint TGA/PBAC pre-submission meeting, use of a single clinical evaluation report that meets both regulatory and reimbursement authority requirements, and information sharing post-market monitoring. ...if you have a drug which is supported through the PBS, there is evidence for it. If the evidence does not exist, you cannot get funding for that particular drug through the PBS; there is not a mechanism to do so. 2.121 Further discussion about the PBAC and MSAC, and how their processes affect LSR cancers, appears at chapter 5. Disturbingly, some medicines took up to 1,600 days (4 ½ years) for a new listing and 2,400 days (more than 6 ½ years) for a subsequent listing. ‘High level’ submissions mean submissions for new medicines (i.e. new listings) and new indications (i.e. new use within a given cancer, irrespective of PBAC major or minor submissions. 2.124 Medicines Australia also provided the committee with a comparison of the Australian reimbursement system with those of other OECD countries which appears at Figure 5—where Australia ranks 18th out of 20 countries, ahead of Portugal and New Zealand—also noting that 'of all the new medicines registered by the TGA between 2009 and 2014, only 39 per cent of them were reimbursed in Australia'. This kind of business approach seeks to establish, as early as possible, a positive response in the regions offering the most potential for profit, due to their large population size. This avoids the situation where a deferral or rejection from a country with a small population, like Australia, could influence other authorities, thereby jeopardising the profit margins that could be achieved in larger countries/regions. 2.126 The Community Affairs Committee acknowledged that the DoH's evidence illustrated that 'this factor is outside the control of the TGA and PBAC', and also cited evidence from the DoH that '[t]he ability to deliver timely access to medicines is also affected by the timing of the applications which, in Australia, is at the discretion of pharmaceutical companies' that may choose to apply for approval in the US or Europe ahead of Australia. The FDA approved the first drug just a couple of weeks ago, Keytruda, which is for any cancer types from anywhere in the body which is mismatch repair deficient tumours. There is a big shift. So pharma companies are starting to see this shift as well and look at drugs across tumour types. From the perspective of genomics, we already think like that. 2.128 Subsequently, in August 2017, the FDA made a comparable ruling on an immunocellular therapy, which Deloitte described as 'signalling its commitment to modernising its processes in alignment with the therapeutic landscape'. 2.129 However, Professor Wilson considered that a lot of research into cell biology is 'very basic research' that will take 'many, many years' to reach fruition. 2.130 Despite accounting for five times the number of other cancer deaths in Australia, rare cancers receive just $6 million annually in NHMRC funding. This can be seen in Figure 6, which illustrates the total amount of funding, including NHMRC funding, awarded to research into cancers from 2006–2011, compared to mortality rates for these cancers. 2.131 This information, and an in-depth analysis of major government and non‑government funding of cancer research in Australia appears in Cancer Australia's 2015 publication Cancer Research in Australia: an overview of funding initiatives to support cancer research capacity in Australia 2006 to 2011, which is the 'first national overview of funding to cancer research in Australia'. 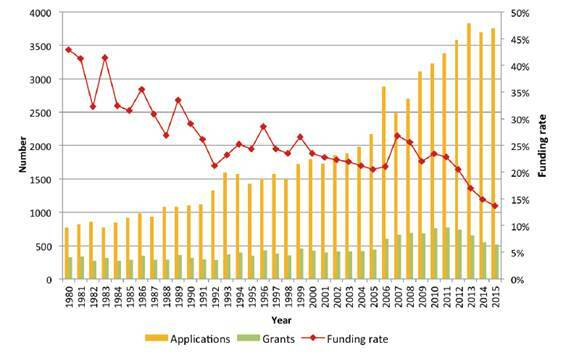 2.132 Consistent with the discussion at paragraphs 2.4–2.8 about funding into cancer research during the period 2016–2018, Figure 7 illustrates that in 2006–2011 the Australian government was the 'major funder of cancer research projects and research programs, people support scheme awards, and building cancer research capacity initiatives and infrastructure awards' providing 58 per cent, or $1.03 billion, of funding. 2.133 As can be seen, 43 per cent of this funding came via the NHMRC with 15 per cent coming from other sources such as the Department of Industry (including the Australian Research Council), Cancer Australia and the DoH. 2.134 Despite this seemingly large allocation of government funding for cancer research, the committee received a number of submissions and heard from a number of witnesses who criticised the lack of government funding for research into LSR cancers. ...lost appropriateness when five-year survival for higher incidence, and comparatively well-funded, cancers (e.g. breast, prostate and childhood leukaemia) started to get close to 100% in stark contrast to other (far) lower-survival and (considerably) lower-funded cancers. ...estimated that in 2012, cancer caused 551,300 DALYs to be lost, representing 19% of the burden of all diseases in Australia. By comparison, cardiovascular disease contributed to 16% of the burden of disease, whilst nervous system and sense organ disorders accounted for 14% of the burden of disease and mental disorders accounted for 13% of the burden of disease. In terms of health care expenditure, in 2008–09, cancer and other neoplasms accounted for $5 billion or 7% of total recurrent health spending. 2.137 The AIHW informed the committee that in addition to DALYs, 'quality‑adjusted life years' (QALYs) can be used as 'a measure of potential health gain from the effect of interventions'. Therefore, both DALYs and QALYs can 'be used in health economic evaluations as a measure of health gain to estimate the potential health benefits of specific health interventions'. However, the AIHW noted that the 'DALY is the standard measure used in burden of disease studies'. 2.138 Another criticism of the lack of funding into LSR cancers was raised by Ms Elizabeth de Somer of Medicines Australia, who commented that although there had been some welcome steps, including the announcement of the first MRFF disbursements, 'there is nothing that particularly targets the rare and low‑survival cancers'. 2.139 Indeed, the CBCF stated in its submission that LSR cancers, including brain cancer, 'have been for some time, in effect discriminated against, within the Government funding system'. The CBCF submitted that LSR cancers 'are clearly unmet medical needs which should be afforded special status by earmarking specific funds and prioritising focus around them'. I am sad with the injustice of research funding allocated to lung cancer. We only get less than five cents in cancer research funding, and lung cancer has a 15 per cent survival rate of living for five years from diagnosis. 2.141 Following the due date for submissions and before the committee's final hearing, on 24 August 2017, the government announced $13 million of funding for competitive research grants from the MRFF, 'designed to boost clinical trial registry activity with priority given to under-researched health priorities, such as rare cancers and rare diseases'. New opportunities for those suffering from rare cancers and rare diseases to participate and benefit from the latest research. Attention given to under researched health priorities and conditions. Deployment of innovative trial designs and recruitment strategies. Purposeful health service engagement to improve the translation of research into practice and improve outcomes for patients. New health treatments, drugs and devices to improve health. Reinforcement of Australia’s position as a preferred destination for clinical trials. 2.143 The DoH subsequently provided information to the committee that, from 2013–14 to 2016–17 it provided approximately $9.1 billion for cancer services and research, which is exclusive of funding from portfolio agencies, such as the NHMRC and Cancer Australia. Lifting clinical trials and registries capacity, clinical trials networks, has $5 million allocated to it. Trial activities specifically targeting adolescents and young adults living with cancer has $5 million of funding for CanTeen. Lifting clinical trials and registries capacity research grants has $13 million, which is designed to accommodate clinical trials on rare cancers and rare diseases. Eight million dollars has been allocated to the next generation of clinical researchers. We also invested $5 million through CanTeen to target trial activity for adolescents and young adults. This cohort sometimes has difficulty gaining access to trials—caught between kids and adults. That activity has been executed. CanTeen is progressing with that work. Last Thursday, 24 August, the minister announced the opening of a $13 million clinical trial and registry program. It's actually titled Lifting Clinical Trials and Registries Capacity. This is directly relevant to the committee because it is designed to attract activity that addresses burden and unmet need. By that I mean rare cancers and rare diseases. In fact, the guidelines preference rare cancer and rare disease applicants. It also is looking at innovative trial methodologies, like, for example, adaptive trial platforms, some innovative and novel approaches to doing trial activity and the application of precision medicine in a trial environment, which is increasingly being used to do a sequence of an individual and specifically target the treatment to that patient. For lots of different reasons, it is beneficial and, perhaps some would argue, even cost effective. Then of course, there is investment in researchers, because you can't just inject a whole bunch of money into the system without building the capacity of researchers. So $8 million to top up existing NHMRC medical practitioner fellowships—and that's progressing quite well as well too. So I think those programs are a demonstration of the sorts of things that you may see over time from the MRFF. The assessment criteria are slightly different to traditional clinical trial structures, so they're divided into three sections. Forty per cent is for significance of grant outcomes, another 40 per cent is for scientific quality and 20 per cent is weighted for team quality and capacity. I think that allocation of 40 per cent for significant grant outcomes presents a lot of opportunity for researchers who, in the space of rare cancers and low-survival cancers, may not have the track record of other researchers. What we're hoping to do with that weighting is also to generate some innovative ideas and design approaches to trials through this application round. 2.147 The significance of the grant outcome is defined in the Guidelines, where '[s]ignificance is the potential to increase knowledge of important topics that achieve the outcomes of the grant opportunity', and will be assessed by reference to a number of considerations. 2.148 A number of submitters and witnesses advocated for specific funding to be set aside for research into low survival rate cancers. 2.149 In respect of quarantining NHMRC funding, Professor Kelso considered that the NHMRC's current model of funding is appropriate, especially in light of the priority-driven funding offered by the MRFF. I am suggesting that the NHMRC as it stands supports 13 per cent of fundable research—that is very high-quality research. I have reviewed that sort of research as part of my job as a researcher. I have reviewed other people's grants, and I have seen grants that I think must get funded but that do not get funded, just because there are not enough funds in the pool. It is not because of any bias; it is just that that is the pool of money, that is how much good research is being put forward, and that is how much preliminary work has been done. Huge amounts of money and time have been put into those applications, to go nowhere, or it has rolled over to next year. So it has to be from outside the NHMRC. You cannot divide up the pie anymore. That is why, if we have a new source such as the MRFF, I would say that is where that sort of funding clearly has to come from, or it is an example of where it should come from. I am just saying it should not come out of NHMRC. ...an opportunity to address the funding shortfall for cancers with low survival rates. We cannot just repeat the consultation process that was used last year to allocate funding for the first two years. This will likely result in a similar outcome. 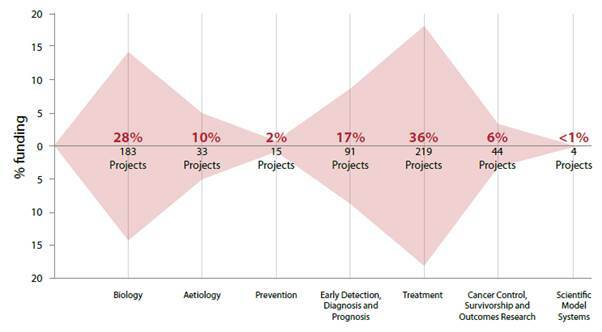 A small amount of the research allocation should be prioritised for low-survival cancers. Otherwise, the current stakeholders will win out. 2.152 In responding to the question of quarantining MRFF funding, Professor Frazer noted that the powers to allocate funding are vested in the minister, pointing out that the AMRAB advises the minister about how to allocate funding, but that 'he is not required to follow our advice'. Professor Frazer noted that the AMRAB had also recommended, going forward, that 'the grants given out should be longer term and larger scale project grants of the order of five years' in order to 'allow bigger problems, if you like, and problems which require more effort over a longer period of time for a larger number of people to be contemplated'. 2.153 It is apparent to the committee that there is an inadequate amount of government and non-government funding allocated towards research into LSR cancers. 2.154 The committee agrees with evidence it has received which demonstrates that the rate of survival for people with LSR cancers will remain stagnant until significantly more funding is allocated for research into these cancers. 2.155 The committee acknowledges the finite amount of government money available for all forms of medical research, and therefore welcomes the government's recent announcement of $13 million of funding for competitive research grants from the MRFF that will prioritise 'under-researched health priorities, such as rare cancers and rare diseases'. It also welcomes the more recent announcement, on 29 October 2017 of the Australian Brain Cancer Mission, a $100 million collaboration of the Australian government, the CBCF and philanthropy to defeat brain cancer. 2.156 The prioritisation of rare cancers and rare diseases in the granting of this funding suggests that the government acknowledges the importance of allocating discrete amounts of funding in order to make progress in combatting rare cancers and rare diseases. 2.157 However, the committee considers that, in order to effectively increase survival rates for people with LSR cancers, the government should go further and, as some submitters and witnesses have suggested, guarantee government funding specifically for research into LSR cancers. 2.158 The committee acknowledges that the NHMRC Act prohibits the minister from recommending 'the allocation of research funds to a particular person, organisation, State or Territory'; however, the Act also empowers the CEO of the NHMRC to identify National Health Priority Areas (NHPAs): major national health issues that make a significant contribution to the burden of disease to which a 'substantial proportion of NHMRC funding is directed'. 'Cancer control' is one of the NHPAs in the NHMRC's Corporate Plan 2017–18. 2.159 The committee urges the CEO of the NHMRC to consider identifying LSR cancers as a NHPA in the upcoming 2018–19 Corporate Plan. The minister may be able to require the NHMRC to do so by way of a referral, pursuant to section 5D of the NHMRC Act, or a ministerial direction, pursuant to section 5E of the NHMRC Act. 2.160 The committee recommends that the Chief Executive Officer of the National Health and Medical Research Council considers identifying low survival rate cancers as a National Health Priority Area in the upcoming 2018-19 Corporate Plan. 2.161 The committee welcomes NHMRC's recent restructure of its grants program. In particular, it supports the introduction of the Ideas Grant scheme which will encourage innovation and assist early-career researchers launch their careers. The committee considers that it is important to encourage researchers to work on LSR cancers as this will also contribute to increased survival rates for people with these cancers. 2.162 Further, the committee considers that the extension of the duration of NHMRC grants—to five years for the duration of the Investigator Grants and Synergy Grants and up to five years for the Ideas Grants—demonstrates the NHMRC's understanding of the long time required to conduct medical research and obtain meaningful results. 2.163 However, the committee is disturbed by the evidence that some drugs may take 10 to 15 years to develop—much longer than a 5 year grant— and that some research is abandoned when funding is no longer available. For these reasons, the committee recommends that the NHMRC introduces the option for extensions to the duration of grants, provided that recipients satisfy certain performance criteria. 2.164 The committee recommends that the National Health and Medical Research Council introduces the option for extensions to the duration of funding to recipients of research grants, provided that these recipients satisfy certain performance criteria.